Being connected is vital to almost any situation nowadays. A slow Internet connection is more than something very annoying. Often wondering how to fix your slow internet? Whether you are staying at a hotel, trying to work remotely, check your social media, or just look up restaurant reviews on Yelp!, you have to deal with the slow internet connection. There are plenty of ways and tips on troubleshooting slow internet. But these require time and they’re not always a proven solution. Fix your slow Internet. See below how easy it is. Why Is My Internet so Slow? What Can I Do to Fix It? Before establishing how slow your Internet is, you should check your ISP contract (including the fine print!) and run a speed test online. Is the speed close to what the contract says? If not, you should definitely reach out to your Internet service provider. If you’re getting slow Internet with all its effects – poor quality video streaming, buffering, disconnects – the culprit is your Internet connection. Low bandwidth, high latency and/or high packet loss are causes for this. Generally, you’d think that contacting your ISP would solve this. Sometimes it does, but what if you’re not at home – e.g. connected to a public WiFi hotspot? What do you do then to fix your slow internet? Troubleshooting Slow Internet? Don’t Bother! slow switching between WiFi / cellular networks on your mobile devices. You certainly saw this already – your smartphone takes at least a few seconds to switch between WiFi networks or from WiFi to cellular. high packet loss rates: packet loss occurs when one or more of the Internet data packets fail to reach their destination. This is mostly visible on bandwidth and latency sensitive applications, such as live streaming. ISP data throttling: sometimes your Internet provider will limit the bandwidth to certain services. That’s why you may see the Internet working just fine in some cases, but buffer or be very slow with others. How to fix your slow Internet the easy way? You need the Speedify fast bonding VPN app on your computer or mobile device! As mentioned above, slow Internet has many possible causes which you need to be able to address, from being stuck on bad WiFi hotspots to seeing high packet loss rates and having to deal with ISPs that throttle the bandwidth of the Internet connection. Speedify helps you use all available connections on your computer or smartphone so you get the combined speed of them. Also, if one of the connections is slow, you’d still get fast Internet from the other connections. True story – that’s what the Speedify app does! 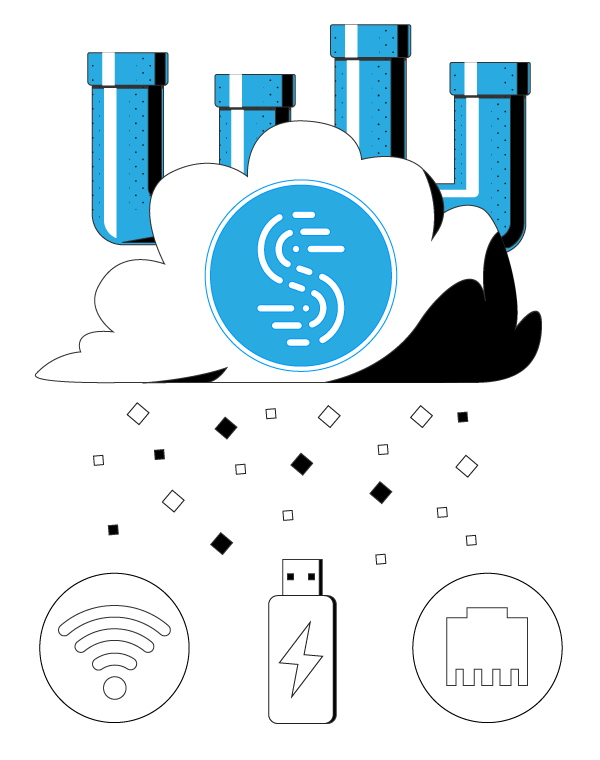 By being able to use multiple Internet connections at the same time, Speedify enables your iPhone, iPad, Android smartphone or computer to maximize the Internet speed. So, you can enjoy streaming videos without buffering, your Spotify will not stop, your Skype business call will not jitter and your video stream will still be online. 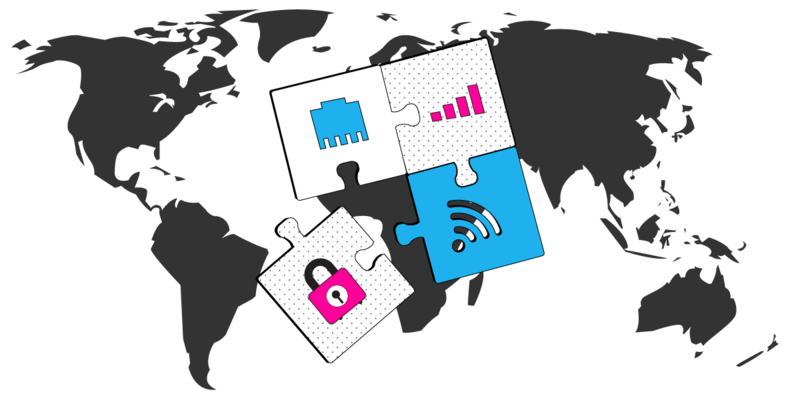 Speedify’s channel bonding technology allows using two or more Internet connections. You’ll get a faster and more stable Internet connection. Get Speedify on your computer or mobile device. It works on iOS, Android, macOS and Windows. Leave all your Internet connections active. For iPhones and Android smartphones – enable both WiFi and cellular data. Don’t worry – you can set data caps from within the Speedify app, so you won’t exceed it and pay extra. For computers and laptops – you can use the wired Ethernet connection, multiple WiFi, additional 4G/LTE dongles or integrated cards. To illustrate that, see the video below on how to combine WiFi ad Ethernet on your computer. Enjoy faster, more reliable Internet. Speedify will automatically detect any new active Internet connections and toss them into the mix to create a faster and dependable Internet connection. Its smart algorithms can detect if one of your connections has performance issues (e.g. bad WiFi hotspot) and fix it so that you’ll always be connected. Speedify is not only a solution on how to fix slow Internet connections. Speedify is also a fast bondingVPN that protects you against fake routers, snooping ISPs, and other cyber threats without sacrificing the speed you demand out of your Internet connections. While other VPNs can be clunky and slow, Speedify improves the speed and quality of your Internet connection, and it doesn’t drain your battery either. You can also test the speed from the app itself to see the facts. How to fix my slow Internet speed? Easy – use the Speedify fast bonding VPN app to reduce packet loss, combine 2 or more Internet connections and avoid ISP data throttling!